Mid-season sale season is upon us, when the stores try to clear out the remaining summer stock while shifting a few AW pieces at the same time. Which means, ladies and gents, now is the perfect time to grab a few bits for your Autumn/Winter wardrobe while you can get it cheap! Topshop and ASOS are the main contenders in today’s picks, so let’s have a little run through what I’ve selected, shall we? Stand out pieces to me are definitely the black loafers, which may find their way into my basket if I can stop myself being in ‘saving’ mode. 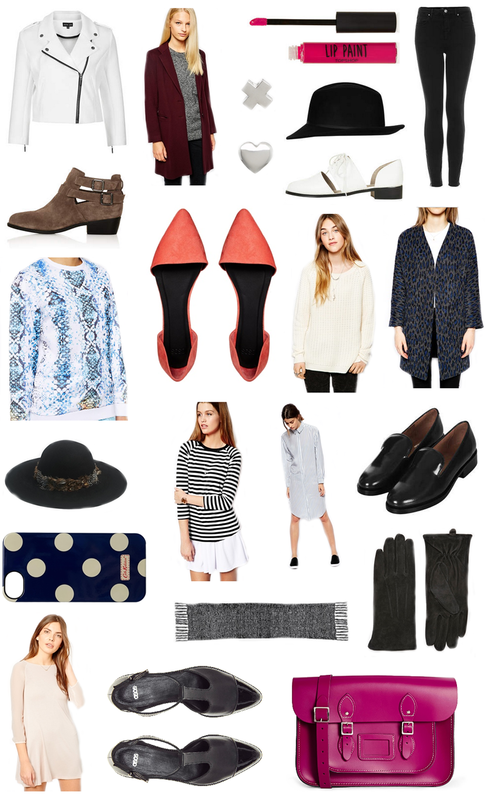 I also love the white biker jacket, t-bar flats and the feather hat – because those plus Autumn are just meant to be. I’d love to snap up that stripe dress too, as ASOS white just seems to nail it every collection. And I can’t not mention that satchel, the colour is perfect for brightening up a dull day! What pieces have you picked up in the sale? Let me know! Next Post BEAUTY: What’s in my Makeup Bag?